Octane is a group of elite young professional musicians, each one dedicated to bringing the absolute best in entertainment for your event. 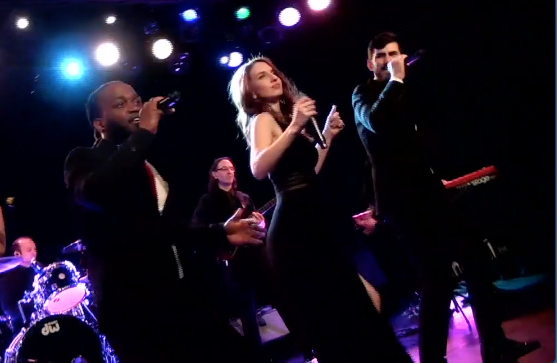 This powerhouse band is experienced in making any evening an unforgettable experience for you and your guests. Members of Octane have performed with Lauryn Hill, Skrillex, Lady Antebellum, Damien Marley, Janelle Monae, Mulgrew Miller, Michael Brecker, Dave Holland, Oz Noy, Sirah, and have performed with the band members of Billy Joel, Jon Bellion, Chubby Checker, Kool & The Gang, The Saturday Night Live Band and more. Literally Octane made our entire wedding. If I could give them more than 5 stars I would and so would everyone who attended my wedding. They made my musical dreams a reality! I always wanted a wedding band and I’m so glad that we chose Octane. People are still raving about how amazing they were and how they brought our party to life. I couldn’t have asked for anything better from start to finish they were on the ball with everything. The musicians coming into the crowd... all of the vocals ...just truly incredible and one of a kind band. I have yet to hear or see any wedding band that would put on the show that they did. They had the whole room dancing and all of my guests talking at how wonderful they were. Absolutely amazing to work with and truly truly made my wedding a dream come true. HIGHLY recommend and without a doubt will be recommending them to everyone I know! Thank you guys for everything!! Booking Octane as our band was THE BEST decision of our entire wedding! They were spectacular! From the first time we saw them at their showcase, through all of our planning they were great to work with. Almost every single guest at our wedding said they were the best wedding band they had ever heard. So many of our friends who are already married and had other bands play at their weddings were mad they didn't book them! Not only are they all incredible musicians who played every genre of music you could imagine, their energy was off the charts. We had close to 300 guest at our wedding and every single person danced the entire night! Even during dinner people were up dancing! My grandma who can barely walk was up dancing with her walker! If you are thinking about booking them for your wedding DO IT! Thank you Octane for helping make our wedding better than we could have ever imagined!!! Octane made our wedding that much special and memorable. We didn't have much time to organize our wedding and a lot of the details are last time. Logan and his team made everything so much more easier on us. They took care of a lot of the detail for us and guide us on what to do and give us suggestions. Logan and his team is awesome!! No MC/DJ can compare to them. They are just as good as Silver Arrow Band or any of the band on the vendor list. Megan and Barry are the dynamic duo at our wedding. Their music repertoire are sensational. They can sing anything!! I think Megan can rap better than Macklemore and Barry can sing like John Legend! We hired Octane for our wedding and they were nothing short of sensational. 3 months later our guests still can't stop talking about how great the band was and neither can we. If you want your wedding to be known for a great time with nonstop singing and dancing than Octane is the only way to go! My wife and I used Logan's cohort for our wedding in August 2016 and couldn't be happier with them! They keep things lively the whole time and everything segues (music, reception events/cues, etc) seamlessly. All of the band members have a synergy with one another and it lends to the vivacity, comfortability, and musicianship. Each member of their band is a professional musician in their own right. They've all been playing for a number of years, and have tons of wedding-performing experience. Logan runs a tight ship, sets the bar high for excellence, and knows how to deliver. One of the singers will be the MC, liaison at the reception, and will be making everything right, keeping everybody at ease, and providing an excited, warmer feel. One of our objectives for our wedding was to have it as far from the typical DJ "sweet sixteen" atmosphere as possible and man, this was it. No gimmicks or tomfoolery. Just professionalism, energy, and musical prowess. The music itself spans the decades (right up through present-day) and you can choose ahead of time what styles you'd want more or less of. If it's anything like two years ago, they can add pieces to the cocktail hour as well, which also flows smoothly (a little light jazz, muted trumpet while the guests ate and drank was a divine touch). They learned three different songs as requested for the first dance, father-daughter, and mother-son dance. They played them live and with passion. You can request tracks, too, but the more live music, the better, right? So many unsolicited remarks from guests kept saying it was the best wedding they attended. We thought it was the usual friends-and-family bias, but it kept coming in months later, and every single one of them mentioned the band. It's no coincidence!